No vet in his right mind would ever cut a chams tail off unless it was rotting. He is probably just starting to shed. Give it 24hrs and check back in here if he doesn’t start shedding soon. And if your going to own a Cham I highly suggest getting a cheap macro lense for your phones camera. They are like $10. It makes providing sharp close up photos so much easier. 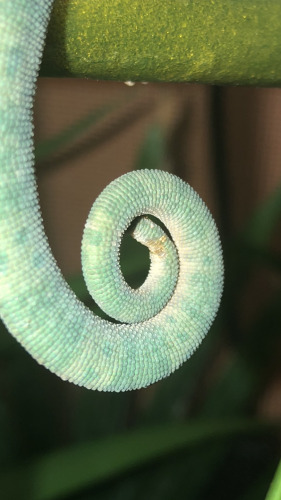 We can see that something is defanitly happening with the tip of his tail but the picture isn’t sharp enough to give you a good diagnosis. Btw he has not started to shed yet but looks like maybe he getting a little pale how long do they usually take to shed?? That maybe an old scar. 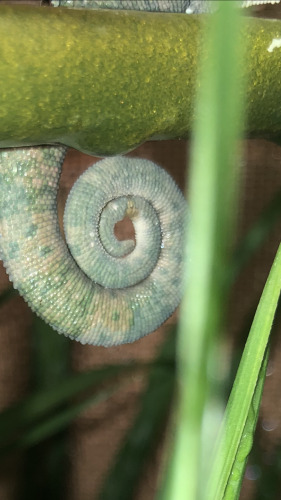 When baby chameleons are housed together too long they start to nip each others tails as they become more territorial or it could be an old burn. There are other possibilities so I would keep a close eye on it and see a vet if it gets bigger. Damn near instantly at that age! Seriously, I’d say 2-3 days max. You need a real gutload, I recommend cricket crack. He should be getting calcium dust without D3 at every feeding. Also should be dusting with calcium with D3 twice a month. He also needs a multivitamin twice a month. Water- invest in a mistking they are worth every penny. 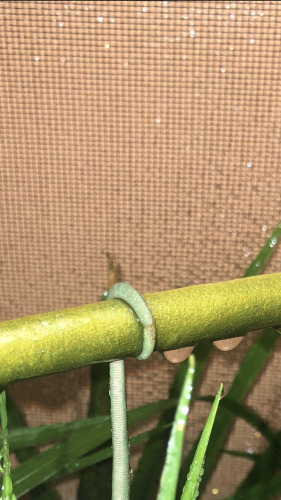 Chams both drink from a rainstorm and clean their eyes with the rain water. If your going to keep handmisting make sure you see him drinking and cleaning his eyes for a few mins before you stop. That cage is big enough now but will need to be upgraded in the coming months. Get a linear uvb hood, much better uvb production for your Cham. 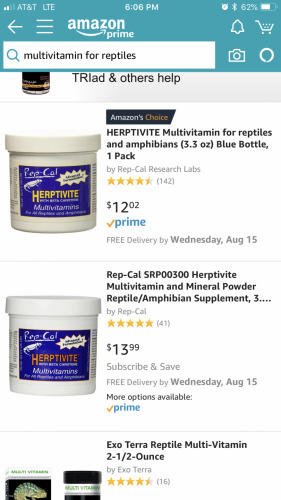 The one you have now is more for bearded dragons I believe. Humidity levels are good but you’ve got to ditch the warm mist humidifier for a cold humidifier. The warm ones cause a lot of URIs. 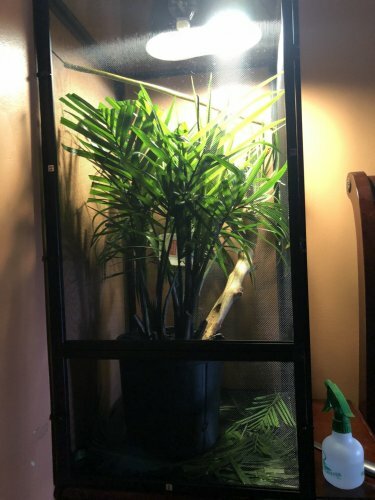 And you defanitly need to add more plants and branches to the top so he can bask. 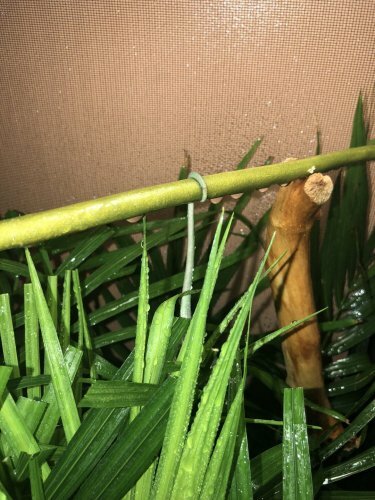 In a chams viv open spaces with no plants or branches running through it = wasted space that your Cham can not use. 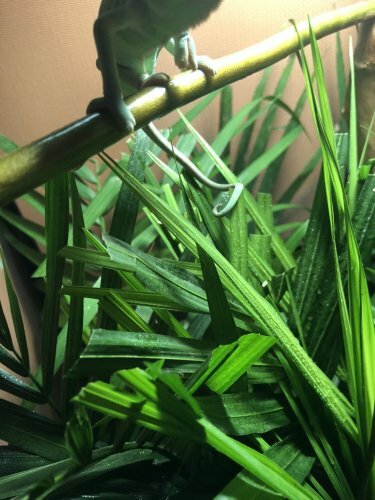 Don’t get discouraged, I had more to fix than this when I got my first Cham! Google images will make you swear your Cham is dying of some horrible rare disease every time! Just come here and ask, it’s what we’re here for. Links and pictures thanks so much I’ll follow everything And get them ASAP.Will do you guys answer faster than my vet and you genuinely care.Will not being checking out google images any more. 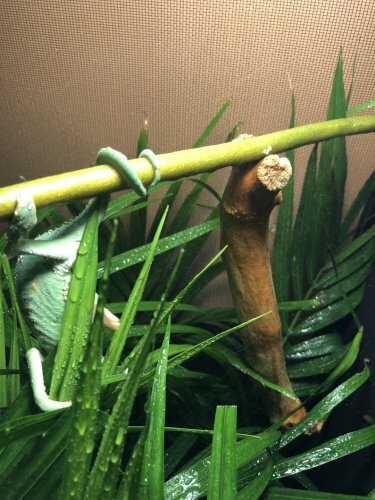 The plants should stop 1/2 to 3/4 of the way up your viv. 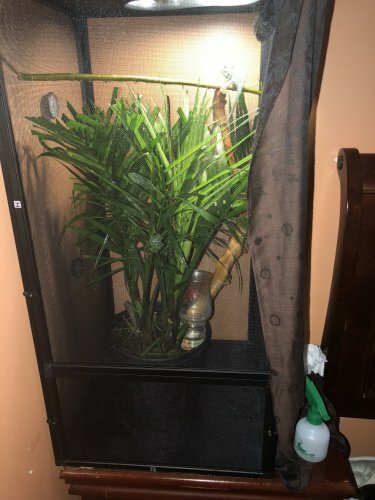 The top section should be mostly branches so he can pic where he wants to bask. Those vines Char333 mentioned work pretty well and you can easily rearrange them as you learn how your Cham uses that space.